THE BRITISH RAILWAY STORIES LTD: "Clarifying - The Last Run"
Just to clarify, and to reassure everyone who seems to think the models are going to be dumped unceremoniously over the course of the next year (and I must add, the set certainly won't be as it will continue to be used for toy & model reviews). I have been researching this and developing it behind the scenes for well over a year. I have observed other CGI productions (Thomas included) worked out a plan of action and talked to the relevant people and compiled as much advice and thought on it as possible. The problem inherent with BRWS as it stands is two fold. Cost and space. I haven't got a Shepperton Studios for dozens of different sets...! Making sets and modifying the models costs a lot of money. ...then of course the building materials for the sets. The Day of the Diesels toy review was simple enough because I've honed my techniques in the small space, and the ability to make a scene look different has come to me over the years. But I have wanted The British Railway Series to be more than the sum of its parts for some years now. I have been unable, at times, to do episodes simply because set A would cost too much or take up too much space to film, or model B needs to be scratch built. Then there's the issue of time. The more complicated they are, the harder they are to film. Episode 17X didn't really progress the story because it was more of the same in many ways. Wonderful characters with a compelling storyline, but not different enough to 17 in many ways. There is nothing to say I can't do both the models and a CGI incarnation alongside each other, in any event. The planned CGI trailer is absolutely necessary - feedback is inherent to the success of future Youtube episodes. I could have just said "CGI trailer next year, we'll leave it till then and the models won't come out again", but I've simplified a very good script in order to give them a final run out; which they and their audience deserve undoubtedly. I know what I have built up over the last four years and this decision hasn't been made overnight on a whim. Nothing is set in concrete other than I want to do this last big special with the models to give them a proper send off, should the planned CGI be well received. I must make the case for CGI here. Thomas & Friends has shown what can be done - camera angles, buildings galore, proper background scenery and weather effects. The problem inherent with the brand is the writing, and to some extent the preparation in terms of the scripts. The way I have scripted new stories is very different to the way I think T&F is done, and it will be a great advantage to me, not a hindrance, particularly if what I have been shown in private is anything to go by. Expansive sets which need only be modelled (as I do with the models, anyway!) on one side. But the advantage is the multitude of sets I could have in a simplified fashion. I have always wanted a King's Cross set and a Leeds Central set, and it hasn't been possible to do so in model form. What about the coaling stage at Copley Hill, or Top Shed and the Met Shed at King's Cross? Then of course there's the multitude of other minor stations and generic scenery that would be possible. Full length trains - and I mean full length trains - and smoke effects which aren't restricted to certain characters (e.g. Stephen as opposed Nigel, say). The people I am working with are very talented at what they do, and the ideas being bounced around at the moment are very favourable. 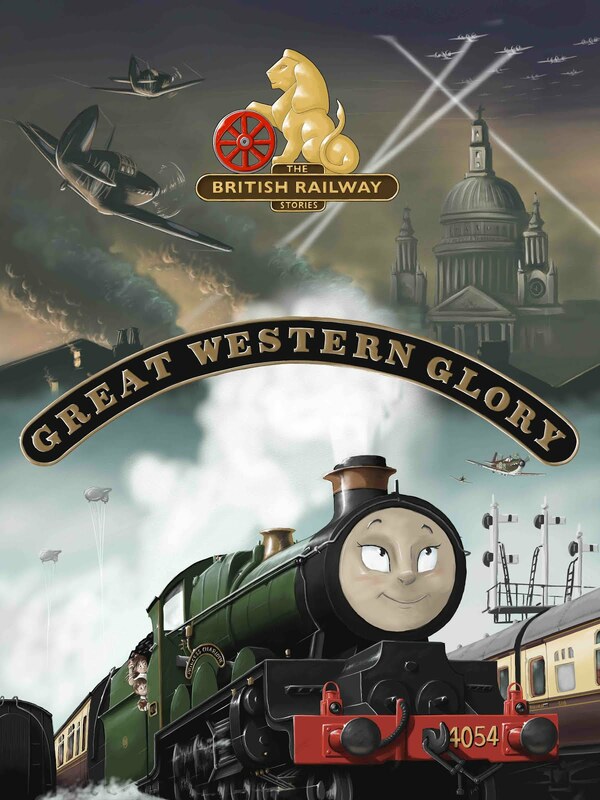 The CGI models are going to be coloured and designed to match the artwork of the upcoming book very closely in style and colour, though of course the limitations of the software will eventually win out in some areas, as has the limitations of the models. In an ideal world I would have had all the major characters scratch built, with smoke units, moving eye mechanisms, and in a bigger scale, but I'm a chap who earns a couple of hundred-ish each month from my adsense, and until this week was struggling for a job. Don't forget that these last episodes will take time, a lot of money, and great effort. CGI is not the pot at the end of the rainbow; but I am well organized, I have a set vision, and I am determined to see it out and see what can be done. If it doesn't work, as I have said to several of my close friends, then the models will win out and we will return to normal viewing! But if I do not try, then the series will never progress beyond the Copley Hill set, and that, more than anything, would be the thing which eventually kills it off. Evolution, not revolution, as they say.